I retard my bread overnight in the fridge and it's just going nuts in there. See photo. I actually tend to go on the longer side of retardation---probably fourteen to sixteen hours on average, sometimes a little less. But it's not the length of the final proof that's doing this; the bread is over the rim of the basket after like four or five hours in the fridge. Bulk ferment: 5-6 hours, give or take. S&F every thirty minutes for first hour and a half; S&F every hour after that. Perhaps your fridge isn't cold enough. Other options might be to go easier on the bulk ferment. I see you have quite a high percentage of starter at close to 40% and you've got wholegrains as well. At 40% starter a 5-6 hour bulk ferment seems a bit too long. Perhaps you could do closer to 4 hours with developing the gluten in the first two hours and resting for the remainder. Shape and refrigerate straight away. Of course it all depends on your starter and how warm it is. The 4 hours is just a guideline. What are you looking for during the bulk ferment to indicate that it's ready for shaping? Another way would be to develop the gluten over about two hours and then refrigerating during the bulk ferment stage. Then after 12-14 hours you could take it out, shape and carry on at room temperature keeping an eye on it. Also to consider is are you over filling your banneton? I'd have to agree with Abe the leven is close to 40%, i think Chad Robertson in his Tartine country loaf uses 20% for a 4 hour fermentation rise, so that is a relatively simple change it will also produce less dough so may fix the to much dough for the banneton if thats another problem, my regular Banneton takes 750g of dough, although your Banneton looks over full the dough piece is retaining it desired shape not spilling down the sides so not a real problem. What size is your bannenton? Can't tell from the picture, but an 8-inch round banneton is used for 500g of dough. A 10-inch round banneton for 1kg of dough. Assuming that all of that dough is making one 1kg loaf, you'd need a 10-inch basket. 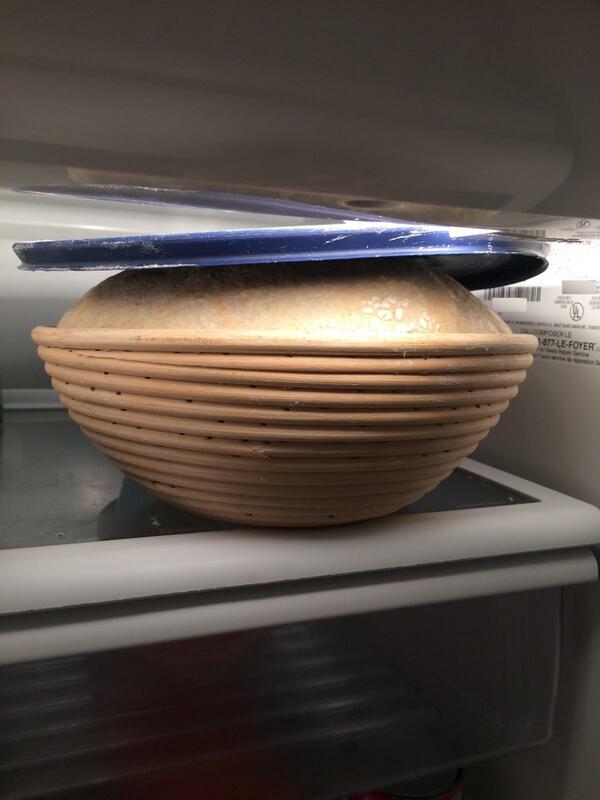 put an ice bag (with a little salt water for good contact) on top of the dough and turn on the oven. You could knock it down in the banneton forming a dough bowl, then put the ice bag in it until morning. I think oiling the ice bag before touching the dough might be a good idea, and/or dusting the deflated dough with flour before contact. Could remove icebag after the dough is thoroughly chilled. Several things are working for the yeast. The banneton from cane is a natural insulator trapping heat in the dough. Chilling the dough while shaping might be a preventative option, when the dough can be spread out thin and cooled. Then the dough temp would be cooler when placed in the fridge, thus slower to rise. Could also lower the dough temp at mixing using cooler water or crushed ice. Might delay shaping but hey, who doesn't like a long ferment?